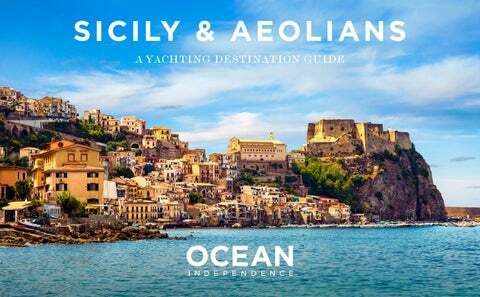 YACHTING IN SICILY AND THE AEOLIAN ISLANDS Bursting with sensory delicacies, cruising Sicily and the Aeolian Islands is a true delight. Inhale the fragrance of zesty lemon groves, tantalize your taste buds with exquisite cuisine and luxuriate in the mild climate. Enjoy the endless breath-taking views whilst sailing crystalline waters and prepare for a typically Italian warm welcome wherever you go. acked with laid-back appeal, the three Egadi islands boast a seductively calm and reliably Italian local atmosphere. The picturesque fishing isle of Favignana, with quaint piazzas and a relaxed pavement-cafĂŠ lifestyle, delivers a low-key welcome. While on charming Levanzo, whitewashed waterfront houses welcome visiting yachts â&#x20AC;&#x201C; notably the prehistoric cave-paintings here are a must-see. Peaceful Marettimo is a natural draw, with countless hiking trails ashore and crystalclear coastal waters filled with underwater delights for diving and snorkelling enthusiasts. The tiny islets of Formica and Maraone simply add to the magic of cruising this lesser-known and strikingly beautiful archipelago. icilyâ&#x20AC;&#x2122;s capital and the largest city on the island, Palermo is located in a sprawling bay underneath the limestone magnificence of Monte Pellegrino. Brimming with distinct atmosphere, explore a cocktail of culture, history and tradition displayed in a blend of Arab-Norman architecture, with the local gastronomy also reflecting the cityâ&#x20AC;&#x2122;s rich multicultural past. The ornate Piazza Bellini and Arab-Norman Palatine Chapel in the Royal Palace should not be missed. Filled with the bustle of modernity amidst ancient architecture, nightlife in Palermo will not disappoint. he remote island of Filicudi is filled with wild and natural wonders. Ancient pathways meander amidst ancient vines and olive trees, while prehistoric village ruins can be found at Capo. Cruise past the famed La Canna rock and the bright blue Grotta del Bue Marino – the area’s largest cave, which is also home to monk seals. Salina is the second largest of the Aeolian Islands and with three of the area’s highest points - one of the most mountainous. Discover freshwater springs, charming villages, lush vegetation and hiking trails. At the end of the day, do not miss the opportunity to drink Malvasia wine at L’Oasi bar in Pollara, while watching watching the spectacular sunset. nown as ‘The V I P Island’ and a favoured choice of fashionistas and jetsetters, Panarea is in fact the smallest of the Aeolian Islands. Take a walk through the car-free, whitewashed streets in chilled San Pietro and soak up the relaxed vibe or anchor off lovely Cala Junco beach and visit the peaceful cove at Le Guilie. A coastal stroll to Punta Milazzese, where Bronze Age settlement foundations perch atop the headland, is highly recommended. Established island nightlife is unsurprisingly lively with modish partying until the early hours at Hotel Raya. In total contrast, magical and remote Stromboli is home to ‘The Black Giant’ volcano, which has erupted non-stop throughout history. Watching the natural fireworks from the privacy of your yacht deck is an incredible experience – alternatively book a guided sunset ascent to the 90 0m summit and witness orange magma shoot from the crater against the darkening sky. azzling Lipari is the largest and most populated isle; a lively place with a small-town feel and island atmosphere. In the north, the white pumice beach and luminescent aquamarine water of Spiaggia Bianca di Pomici is a stunning sight. Wander around pretty Lipari Town, filled with winding lanes lined with boutiques, restaurants and local delicatessens: purchase some delicious local capers and Malvasia wine here. Donâ&#x20AC;&#x2122;t forget to embrace the infectious Sicilian atmosphere and relish Lipariâ&#x20AC;&#x2122;s bustling and fun nightlife. In iconic Vulcano, the Faraglione della Fabbrica hot springs are a great spot to relax in the therapeutic mud. Home to Fossa di Vulcano, which gives the island some beautiful black sand beaches, this is an ideal place to spend time snorkelling and swimming. icturesque Taormina clings to the cliffs high above the eastern coast, with terraces that cascade down to the sea. Strewn with cobblestone piazzas, elegant shops and outdoor cafĂŠs, there are an array of popular beaches that locals access from land by an aerial tramway. Admire Greek ingenuity found in the archaeological ruins, Saracen castle and the spectacular ancient theatre, whilst impressive Mount Etna stands proudly in the distance. Cruising the impossibly blue coastal waters as the painted hillside rises aloft, it is easy to see the inspiration that has motivated generations of artists and writers visiting Sicily. ncient port and second largest Sicilian city, UNESCO-listed Catania, is bursting with rich historical delights. Monochrome palazzi towers overlook ochre-hued piazzas, while famed La Pescheria market buzzes with life. Cuisine is every native Sicilian’s prerequisite and the home of ‘Pasta a la Norma’ does not disappoint with its delicious local fare. Nearby beaches attract a bustling crowd, with waterfront bars and sandy stretches transforming at sundown when DJ’s arrive to set the scene.